Like other teams have had, Sacramento State's website released a nice article on the start of practice. Let's take a look at some of the most interesting nuggets from their news release. Sacramento State finished with a 7-21 record last season, but that mark could have easily been better. The Hornets went 3-9 in games that were decided by six points or less, or that went into overtime. Making things even more grueling is the Hornets had late leads in five of those nine losses. The team’s four overtime losses were a single-season program record. There are two schools of thought on this - One, that this is a stat that shows they are not "clutch" and that they do not know how to win close games. Two, that they got unlucky, and those things tend to balance out. I subscribe to the second theory. If they can turn a couple of those close games around, then they begin to inch closer to the .500 mark, and that would be a nice goal for them this year. Sacramento State’s four conference wins last season marked the third straight year the team has increased its league win total. Considering that 4 wins was just good enough to tie for last place, this seems to be an unwitting case of "damning with faint praise." I like their optimism though! Sacramento State finished the season with a positive rebounding margin (993-969), snapping a streak of 23 consecutive years the team had finished with less rebounds than the opposition. That stat is hard to imagine... 23 straight years of being outrebounded! Kudos to Brian Katz and last year's team for breaking the streak, that is definitely a good sign. It will be tough to repeat that this year after the loss of Alpha N'Diaye. Of the 12 Hornets to expire their eligibility under head coach Brian Katz, 10 have graduated and the other players (Sultan Toles-Bey and Duro Bjegovic) are on pace to graduate this fall. Schools rarely get recognition for this type of thing so kudos to Brian Katz for this. This is the ultimate goal, and so it is good to see guys graduate. #32 John Dickson - F, 6-6, 195, Jr., San Francisco, Calif.
An honorable mention all-Big Sky Conference selection...appeared in all 28 games, including 25 starts as a true sophomore…averaged 10.9 points, 4.2 rebounds, 0.8 steals and 0.6 blocked shots per game…shot 42.2 percent (97-230) from the field and 76.3 percent (106-139) from the free throw line…was the team’s second-leading scorer and fourth-leading rebounder…led the team in both free throws made and attempted…the 106 free throws made tied for the fourth best mark in the Big Sky Conference…in league play, he increased his numbers to a team-best 12.6 points per game to go along with 4.8 rebounds and 0.9 blocked shots per game…scored in double figures in 12 of the team’s 16 league games. Dickson is their best returnee in my opinion, and could have a shot at getting some postseason awards in the Big Sky. He is a solid scorer (as long as he stays away from taking 3s) and a decent rebounder for his size. He will be counted on to be a rock for them. #5 Dylan Garrity - G, 6-2, 170, Fr., Huntington Beach, Calif.
A 2011 graduate of Edison High School in Huntington Beach, Calif…played four years of varsity basketball for the Chargers…a two-time all-state, two-time Sunset League MVP, three-time first team all-section, three-time first team all-league, three-time all-county and three-year team captain…became the first player to have his jersey retired in the 42-year history of the Edison High School boys basketball program…finished as the school’s all-time leader in games (114), points (1,729) and assists (438)…averaged at least 17 points a game each of his final three seasons…finished with career averages of 15.2 points, 3.9 assists, 3.1 rebounds and 1.6 steals per game while shooting 48.8 percent (556-1139) from the field, 44.0 percent (211-480) from the three-point line and 84.1 percent (406-483) from the free throw line. I have already written quite a bit about Dylan Garrity, but he has a chance to be one of the best freshmen entering the Big Sky this year, and he could have a nice impact for them. 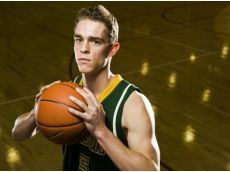 If he can develop into a big-time player, that is probably the Hornets best chances of becoming a factor in the Big Sky. Maybe not this year, but sometime in the next couple of years. What are your all thoughts on Sacramento State?